Humanity has become increasingly dependent upon technology. We have externalised vast amounts of our collective memory in print while our personal moments are committed to public databases and web connected devices. We augment our experience of the world through various devices every day. Already we can see the effects of Technopoly on our culture as those less privilege or less adaptive have been disadvantaged. The vast majority of the world’s population has no access to the internet, our greatest and most democratic cache of information. Meanwhile others voluntarily implant chips to streamline their morning routines. It is not unreasonable then to expect that some may feel now, as the Luddites felt about the mechanised loom during the early 19th-century. 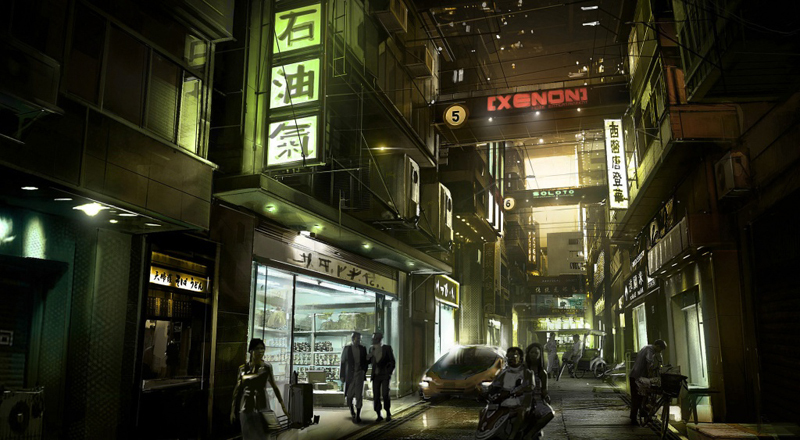 While it’s unlikely that our existence will resemble that of Deus Ex: Human Revolution come 2027 with its Blade Runner meets Ghost in the Shell dystopia. Human Revolutions near future, cyber punk universe feels familiar. It presents a world sent into shock by technological creep as humans broadly adopt biomechanical augmentations. A world divided by those who regard the technology as humanities next vital step and those who value the purity natural evolution. Set twenty five years before the events of Warren Spectors legendary Deus Ex, the player commands Adam Jenson an ex-SWAT team leader with a troubled past define by moral struggle. An incident at Sarif industries, a leading biotech firm where Jensen is employed as security chief, leaves Jenson clinging to life and key Sarif staff missing. After receiving extensive augmentations to preserve his life, Jenson is called back to Sarif, ultimately travelling the globe in search of his colleagues. Jenson is conflicted by the work of his employer and distrusting of his cutting edge augmentations. Creating an ambiguity which allows the player to shape the morality of their protagonist with little compromise. In contrast to the dichotomous morality systems typical in so many videogames, Human Revolution provides subtle feedback in conversation to reflect the players choices. Rewarding perception while allowing players to develop their own conclusions and ultimately dabble in shades of grey. Far more potent and satisfying then a collection of points. This approach provokes greater consideration of the story, the human condition, political and economic effects of transhumanism, among other themes presented. It allows the player to engaged with the material more intellectually. This engagement is only enhanced by the profound side stories, interesting news reports and personal e-mails spread throughout the experience. Each one building context for Jenson and the world he inhabits. Granting the player a deeper insight into the ambitions and struggles within this dystopia. Stylistically, Human Revolution is a melting pot of east and west with Renaissance era influence, black and gold colour palette and transhumanist overtones. The characters are thoughtfully detailed bearing comic book like qualities. Dressed in contemporary high fashion resembling out fits by Gareth Pugh or Alexander McQueen with baroque and 16th-century details. Jonathan Jacques-Belletête’s art direction is superb, which only emphasises the stylistic disparity of the pre-rendered sequences and poorly resolved mattes. Both feel like relics of an era past, much like the highly criticised boss encounters. These skirmishes are an uncharacteristic departure from the otherwise well crafted scenarios and player guided narrative. If approached aggressively these moments appear natural. However, if the player has perused a non-lethal approach to the story, Jenson will almost certainly find himself ill prepared, with no alternative but to face his bristling opponent, armed only a re-purposed animal tranquilizer. The environments are detailed and superbly flexible, concealing a great number of solutions to each problem. Each path feels natural, with many options only apparent once committed to the first. Players will gravitate to solutions that suit their motives, perhaps never encountering others. The sparse corporate interiors and dark, dirty streets are welcome staples of the genre and a strong aesthetic tie to franchise. Human Revolution is a worthy successor to the decade old Deus Ex, and an outstanding launch title for the newly established Eidos Montreal. Both its characters and narrative are well resolved, mirroring the tone and rhythm of the first instalment. Third person hand to hand and cover mechanic, improved conversation system and hacking mini games, all improve and modernise the experience. Untimely, Deus Ex devotees will not be disappointed. Games Reviewer – Bjorn Rust.